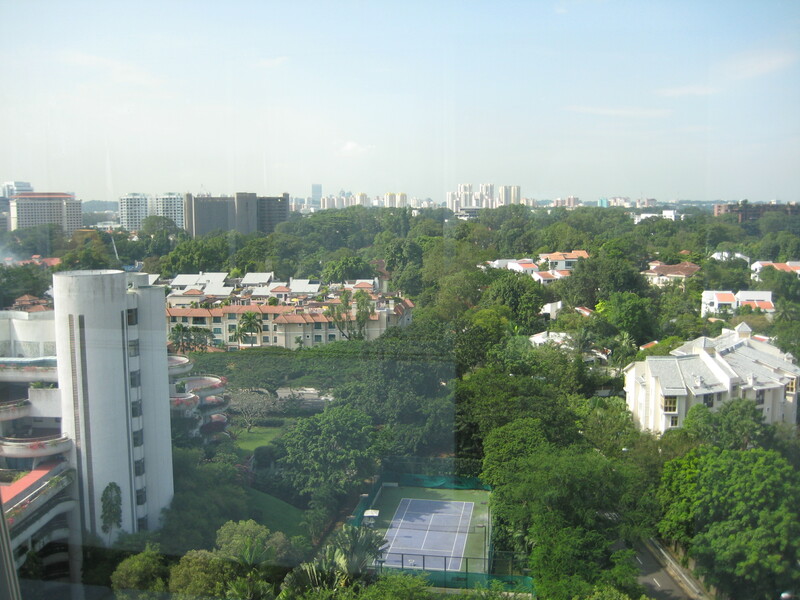 Friday, January 11: This morning, we leave Singapore and fly to Phuket, Thailand, where we have the weekend to relax before our new round of lectures begins Monday morning in Bangkok. 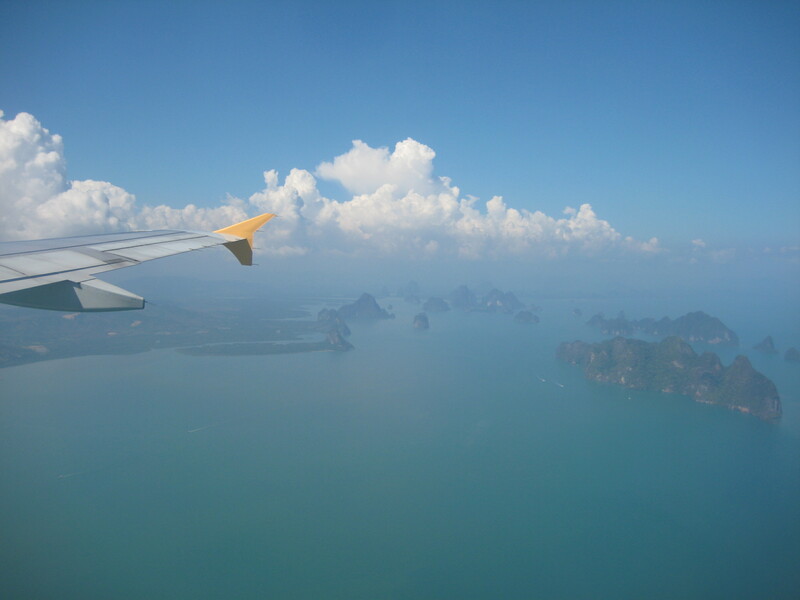 We fly to the airport in Phuket and drive to our hotel, the Club Andaman Beach Resort, in town. 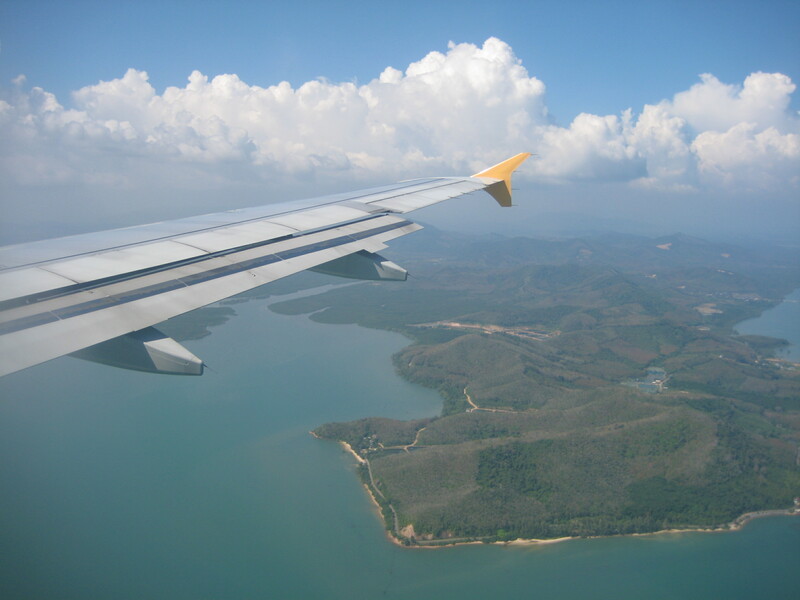 Phuket is a bustling town on Patong Bay in the south of Thailand. 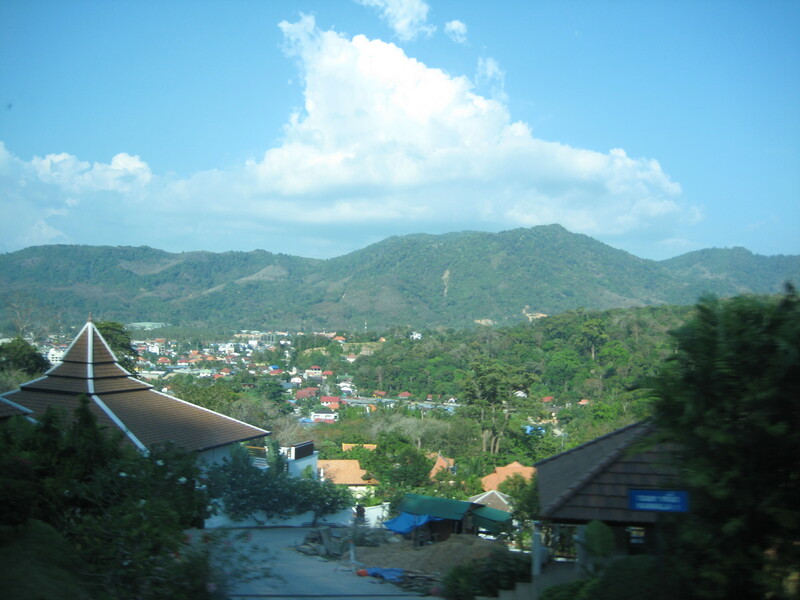 I see no visible signs of the tsunami that devastated the town in December 2004. 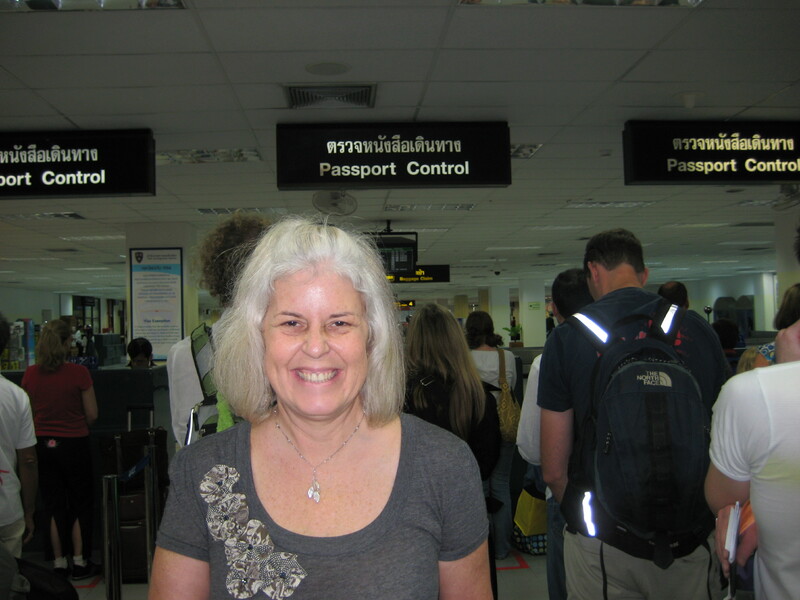 It seems to be business as usual, although I must admit I don’t know what it was like before the tsunami. 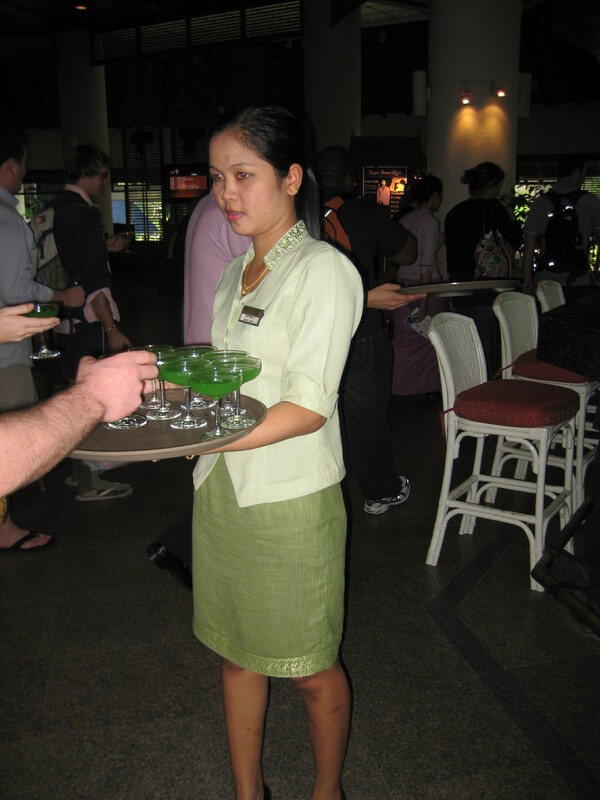 Christmas lights and New Year’s decorations are still up throughout the town, reminding us of what we’ve left behind in the U.S.
At Club Andaman Beach Resort, we are greeted by a charming Thai woman in a green dress, serving lime green drinks of guava juice. The club is lovely, with an open air lobby and teak walls. 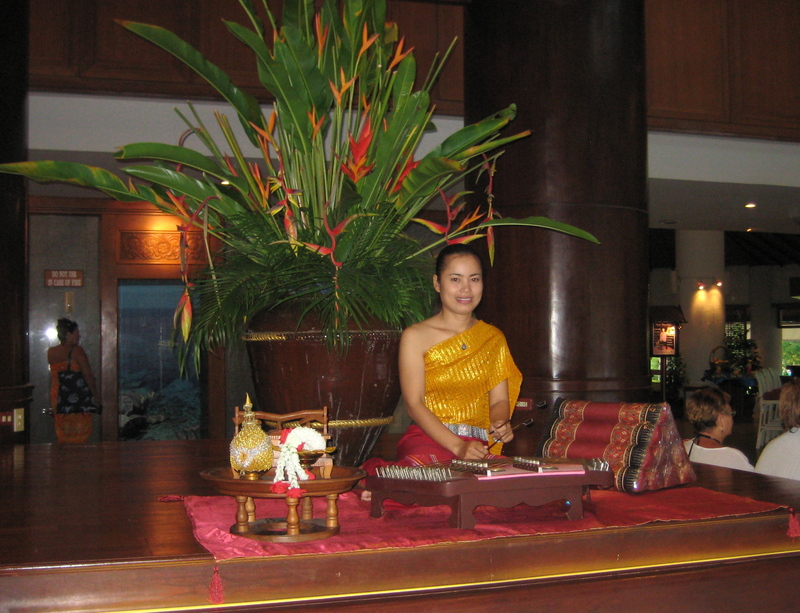 Another Thai woman sits cross-legged on a platform playing a tranquil melody on a musical instrument of some kind. The grounds of the Club are impossibly green and beautifully manicured. 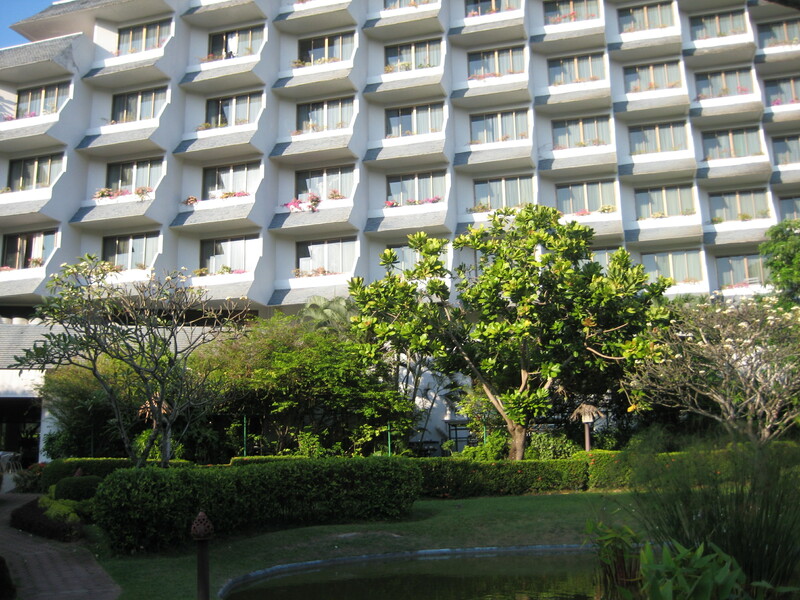 The resort includes Thai style cottages and a high-rise, white, concrete building. 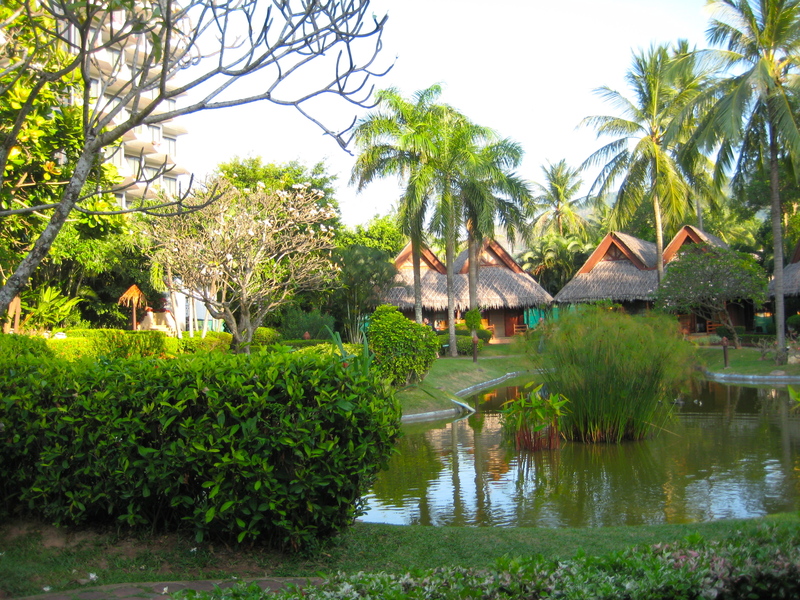 The Thai style village cottages are more basic than the rooms, overlooking 15 acres of landscaped tropical gardens and pools as well as a nice pond. 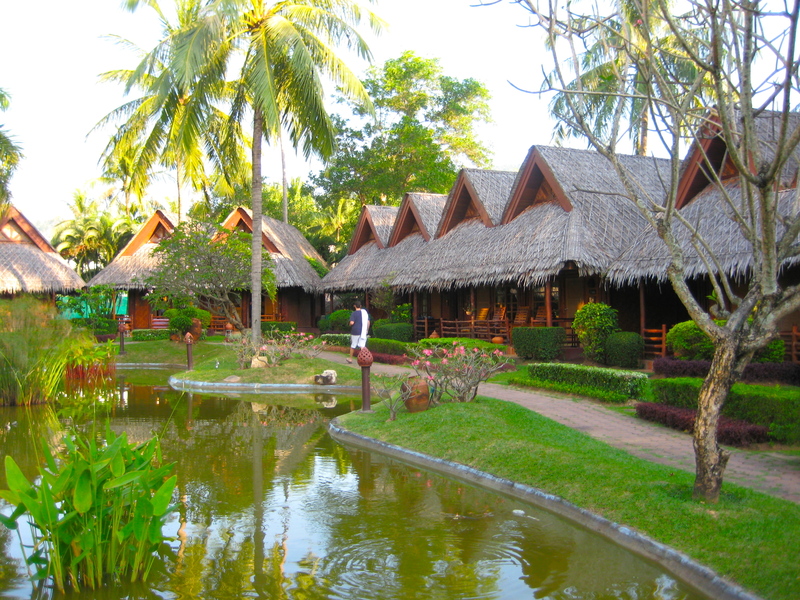 Our room is in one of the Thai-style cottages. 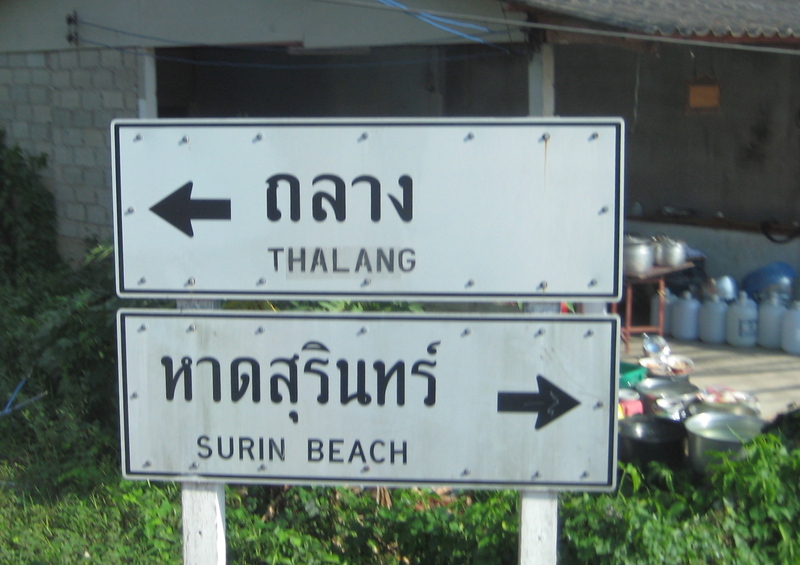 The resort is located near the famous Patong Beach, but not on the beachfront. 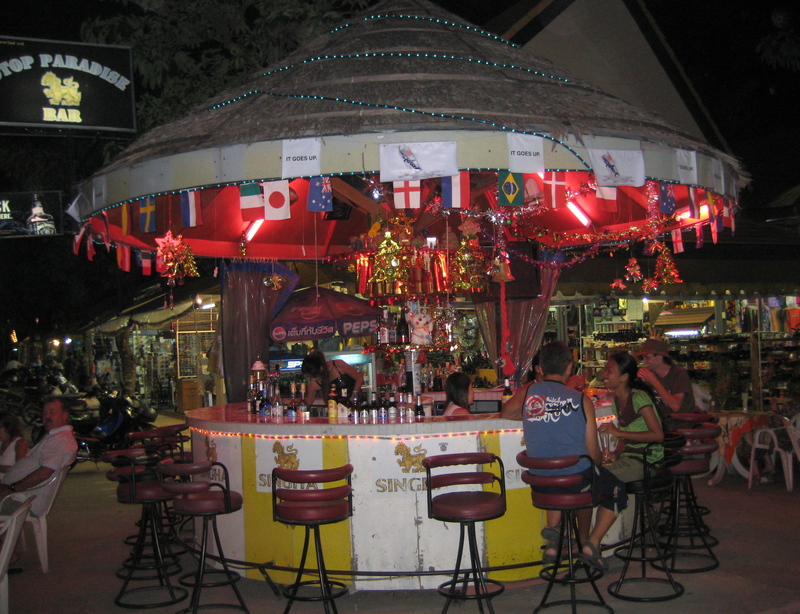 Patong Beach offers nightlife, as well as a range of restaurants and shops (ebookers.com: Club Andaman Beach Resort). 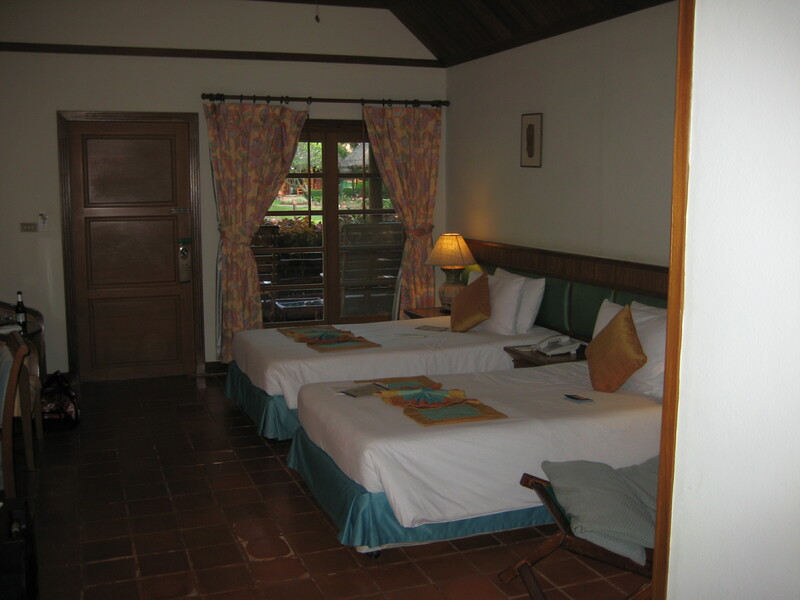 We go soon after to settle into our rooms (agoda: Club Andaman Beach Resort). 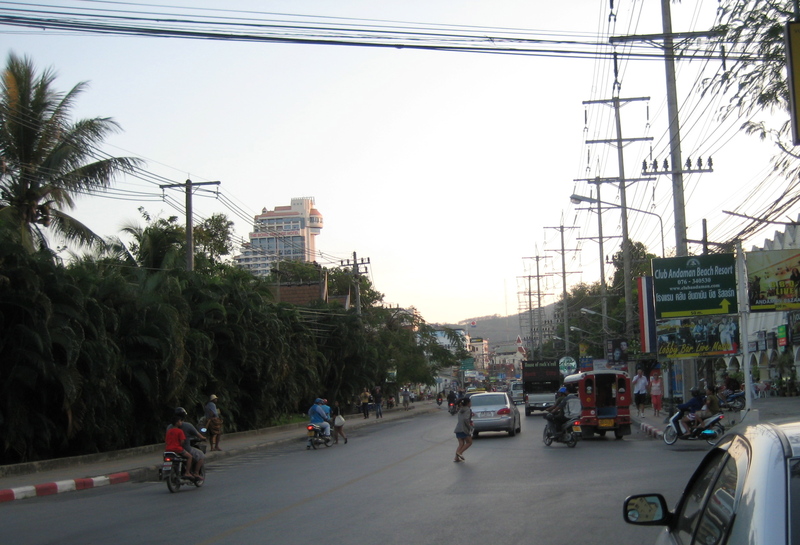 We head out to explore the streets of Phuket. Motorbikes are everywhere in Phuket: a very cheap mode of transportation for the poorer population. A number of us walk down the main street from the Club and pick out a sidewalk restaurant that has photos of the food posted on a billboard. 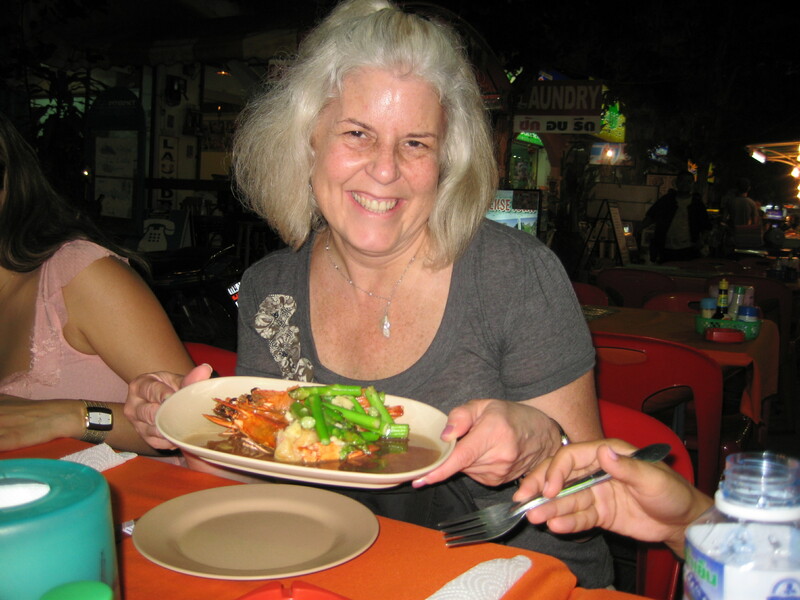 I order tiger prawns and asparagus; I’m able to pick out the number and sizes of the fresh prawns for them to cook. The food is delicious. I order a Tiger beer; it is much less expensive than the 15 Singapore dollars I paid at the Meze Bar in that city. 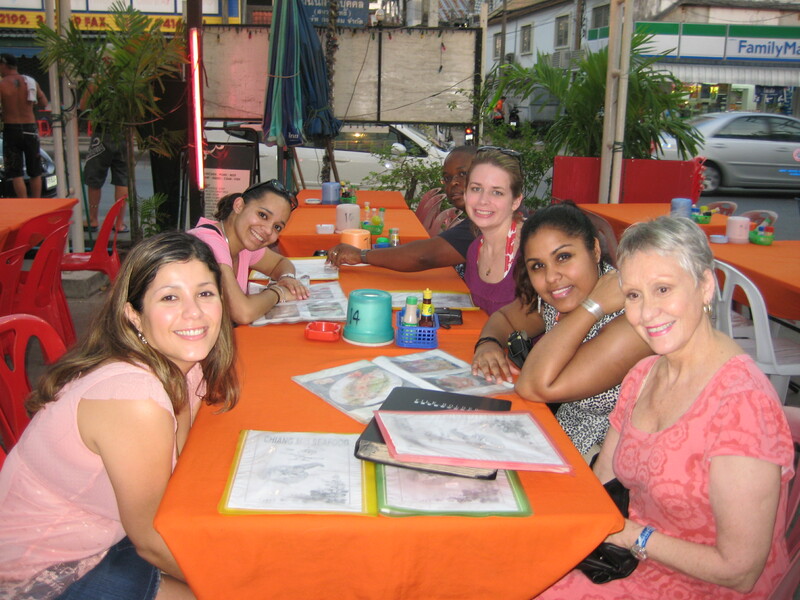 dinner at a fresh fish restaurant along the street in Phuket: Johanna, Luz, ? ?, Jennifer, Juliana and ?? 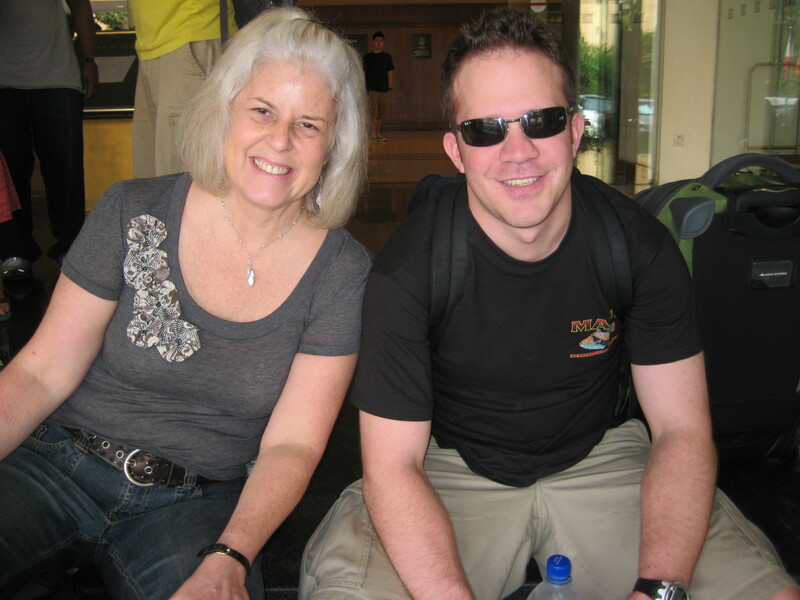 You are the best, Anne Thomas!! You are absolutely right! It’s so great when I can rely on my readers to tell me information that I have forgotten. 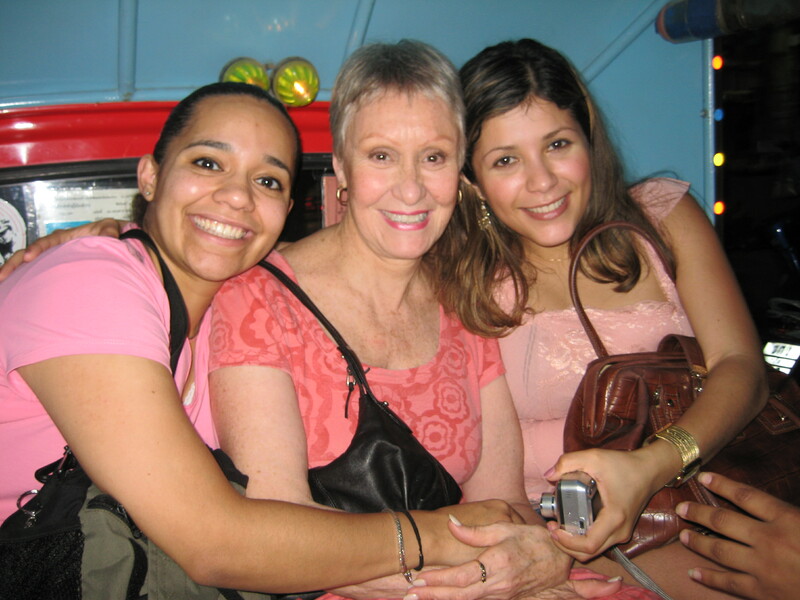 I’m trying to recreate this trip from over 5 years ago, and believe me, my memory is failing me in too many ways to count. This was back before I kept a journal and I don’t think I wrote down much about this trip at all. The only thing I have are the syllabus, which wasn’t very detailed, and my pathetic pictures. Thank goodness my photography has improved in recent years because these leave a lot to be desired.